Why does everything look cuter when it's shrunk? 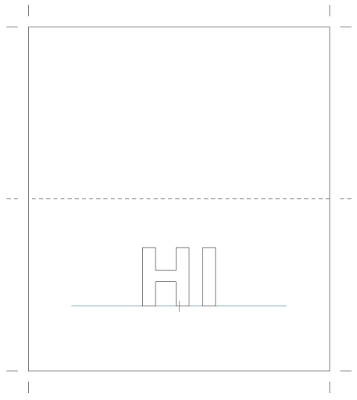 I printed the letters H and I from my book at 25%, and applied them on a folded notecard, to be tucked into hubbie's lunch bag. Since the size of the overall design is smaller, I'm using 1/8" width strips this time. I'm still cutting my own strips from Canson Mi-Teintes paper. The letters are straight sided and therefore simple to accomplish. To load this latest tutorial video with knowledge nuggets, I'm showing how I cut card stock from my template. I've got a simple method to prevent the template from shifting while cutting. Hand cutting can seem so simple, but what if it becomes skewed? I'll show you how I manage to make clean, neat cuts. 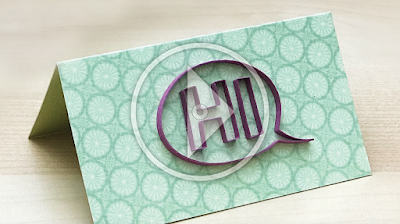 Download the free note card pattern and start quilling your own message! My new PDF e-book, Quilling Letters is available in my Etsy shop. 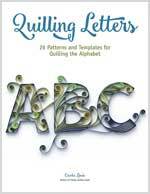 Every side and curve of the 26 letters of the alphabet is pre-measured – just lay your strip on top of my patterns, score, snip, fold, and glue.